The Italian classicism that underscores much of Milan Fashion Week’s offering is arguably its downfall. Where is the modernity? The answer, this season past, was found in Alessandro Michele’s Gucci, the Moncler collaboration project and the emerging talents such as Erika Cavallini, and Francisco Risso who helms Marni. One storied house is changing things up, however, distancing themselves from the constraints of classic Milanese fashion with a renewed spirit and an enlightened vision of women: MaxMara. Black, Asian and Hispanic identities have become increasingly present on their runway. They made headlines in the Fall 2017 season when Hijab-wearing model Halima Aden was selected to open their show. This gives the brand’s work an entirely new context. It’s transportive too—gone are the days of solely catering to the white Italian woman, this is gambit for the socially aware social media generation and the generation that came before them, an attempt to win a new base by simply representing more people. Of course, diversity isn’t about quotas. This gesture is a rather natural progression which fits with the brand identity. After all, it is famous for its camel-coloured coats and luxurious outerwear, something which can slot into the wardrobe of any woman. 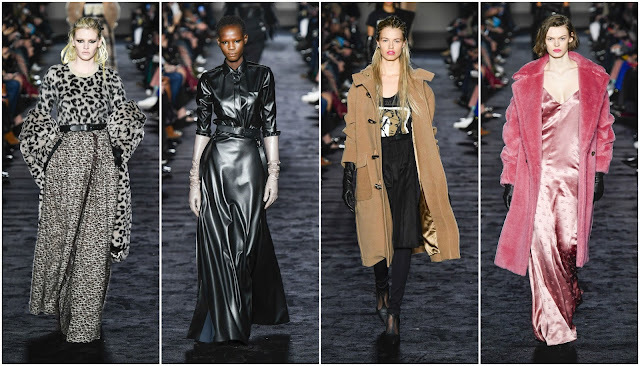 Plenty of that was on show—they used the finest furs, lustrously luxe leathers and decadent animalia. It was a bit dated, a nineties regression of sorts. It was both in line with trends and its identity as a brand. They traversed numerous decades, appropriating styles. Each look was like an individual time capsule. It was a pleasurably pinball from decade to decade but ultimately it was a blow to cohesion. It was a mostly black and grey affair with few pops of colour. Where colour did emerge it was the most eye-catching and captivating moments. Fran Summers’ sharp-shouldered dusty rose, double-breasted suit jacket felt like an ode to the eighties; this expression of womanhood was rampant in Milan. American model Cara Taylor was ravishing in a blush-hued slip dress and Pepto Bismol pink fur coat which hewed on forties styles. In a dark show space, with a predominately dark colour palette, these moments of lightness were rare life forces in an otherwise forgettable show.